The search for the origin of modern human behaviour and technological advancement among our ancestors in southern Africa some 70 000 years ago, has taken a step closer to firmly establishing Africa, and especially South Africa, as the primary centre for the early development of human behaviour. 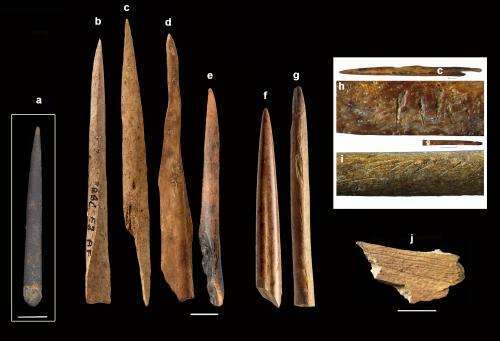 A new research paper by renowned Wits University archaeologist, Prof. Christopher Henshilwood, is the first detailed summary of the time periods he and a group of international researchers have been studying in South Africa: namely the Still Bay techno-traditions (c. 75 000 – 70 000 years) and the Howiesons Poort techno-tradition (c. 65 000 – 60 000 years). The paper, entitled Late Pleistocene Techno-traditions in Southern Africa: A Review of the Still Bay and Howiesons Poort, c. 75 ka, has been published online in the Journal of World Prehistory on 6 November 2012. Henshilwood says these periods were significant in the development of Homo sapiens behaviour in southern Africa. They were periods of many innovations including, for example, the first abstract art (engraved ochre and engraved ostrich eggshell); the first jewellery (shell beads); the first bone tools; the earliest use of the pressure flaking technique, that was used in combination with heating to make stone spear points and the first probable use of stone tipped arrows launched by bow. "All of these innovations, plus many others we are just discovering, clearly show that Homo sapiens in southern Africa at that time were cognitively modern and behaving in many ways like ourselves. It is a good reason to be proud of our earliest, common ancestors who lived and evolved in South Africa and who later spread out into the rest of the world after about 60 000 years," says Henshilwood. The research also addresses some of the nagging questions as to what drove our ancestors to develop these innovative technologies. According to Henshilwood answers to these questions are, in part, found in demography and climate change, particularly changing sea levels, which were major drivers of innovation and variability in material culture. This paper is just the latest to come from Henshilwood and his teams' research on African archaeology that revolutionised the idea that modern human behaviour originated in Europe after about 40 000 years ago. 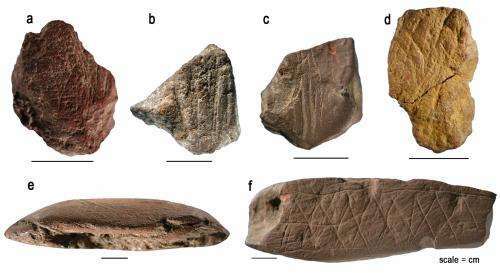 There is increasing evidence for an African origin for behavioural and technological modernity more than 70 000 years ago and that the earliest origin of all Homo sapiens lies in Africa with a special focus in southern Africa. Henshilwood writes: "In just the past decade our knowledge of Homo sapiens behaviour in the Middle Stone Age, and in particular of the Still Bay and Howiesons Poort, has expanded considerably. With the benefit of hindsight we may ironically conclude that the origins of 'Neanthropic Man', the epitome of behavioural modernity in Europe, lay after all in Africa." Thank god for climate change! We would still be swinging in trees without it. large climate change swings will benefit some species at the expense of others -- unless of course the swing is big enough to kill everything! Last time it benefited us. This time, probably not so much. We use so much of the environment, and as efficiently as possible, that ANY change is going to be negative. The only question is HOW negative. ... or man may just adapt as we did through the last several ice ages and hot spells. A more probably reason for spreading out is they had superior culture/technology; hence, there was little resistance from others. What's neat here is we can see a dominant technological society and where it started; southern Africa! You'd think central east Africa or even somewhere in southern Europe or southwest Asia. What's also exciting is how it's not just weapons but art that was dominant in this culture seventy thousand years ago. Last time we adapted. This time, probably not so much. The number of killed and suffering from weather extremes of any kind, mostly the poor, is so large that ANY increased hot weather extreme rate and amplitude is going to mean a lot more deaths and suffering, and a heavily increased cost. The only question is HOW much morals and money we are willing to throw away on something preventable. @ flashgordon: It was probably complicated - note the large lag time before spreading. But they didn't meet a heavy population density, if the Neanderthal and Denisovan population models are correct (and they seem to be). Humans will survive, the question is what will we be then? Morlocks? Back at hairy club wielders?